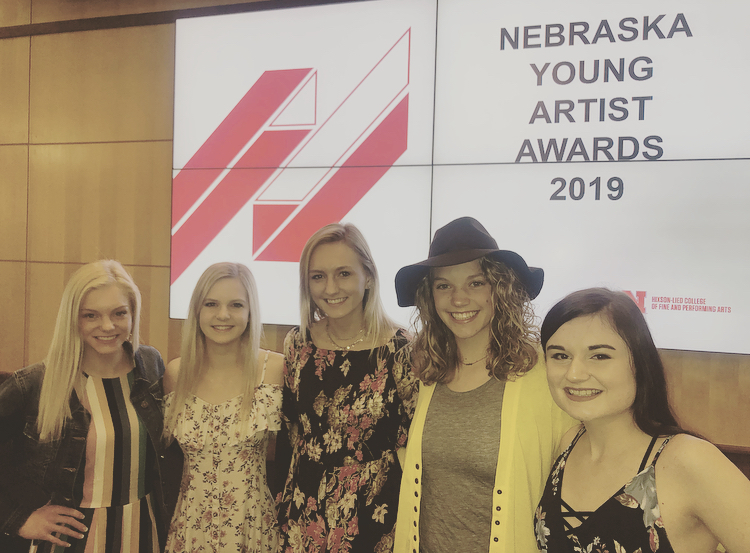 Five Cozad High School Juniors were awarded the 2019 Nebraska Young Artist recognition. Juniors receiving this award were Haley Cargill, Abigail Nelsen, Ayden Ourada, Ahnika Svajgr, and Abby Worrell. The Nebraska Young Artist Awards annually recognize 11th grade students from Nebraska who are gifted and talented in the areas of visual art, dance, music, theatre, and emerging media arts. These students exemplify the pinnacles of creativity in one of the fine and performing arts. Students applied for the recognition and submitted an example of their work. Applications were received from 178 students across the state. Hixson-Lied College of Fine and Performing Arts faculty chose the 73 students who were honored on April 3, 2019, in Lincoln. The Honored students had the opportunity to take tours of the arts facilities, attend classes, meet faculty and college students and have lunch. Congratulations to these young artist and their accomplishments!